The European transport sector needs a transformation if it is to support a green Europe in 2049. Solutions to transport’s most pressing environmental problems are emerging, but will bring their own challenges. Sustainable mobility experts Ian Skinner, Huib van Essen, and Anouk van Grinsven analyse what the opportunities and dilemmas mean for how we live and move, and outline how policy-makers can best respond. In 2049, transport is likely to be just as important to our lives as it is today. A green Europe will therefore not be possible without a ‘green’ transport system to go with it. As it stands, from a purely environmental perspective, transport is problematic: the sector emits greenhouse gases (GHGs), contributes to poor air quality and noise pollution, and damages habitats and wildlife. More broadly, transport has negative impacts on human health, such as accidents, and busy roads in towns and cities reduce quality of life. The environmental problems posed by transport are currently significant. When it comes to GHG emissions and climate change, transport is the most intractable sector. The EU electricity sector still produces higher GHG emissions overall, but these have been declining considerably. Transport sector emissions have started to increase once more, after a slight decline caused by the financial crisis of the late 2000s. According to the European Environment Agency (EEA), GHG emissions from transport now make up 27 per cent of the EU’s annual total, if you include the increasing emissions from aviation and maritime transport. Poor air quality and excessive noise levels in towns and cities are also largely caused by transport. The EEA estimates that nearly 3 per cent of the EU’s population (equivalent to the combined population of Slovakia and the Czech Republic) is exposed to levels of air pollution in excess of the EU’s legal limits for nitrogen dioxide, particulate matter, and fine particulate matter (PM10 and PM2.5 respectively). A significantly larger proportion – 43 and 84 per cent respectively – are exposed to levels of PM10 and PM2.5 in excess of the World Health Organisation’s more stringent guidelines. The agency also estimates that 100 million people in its member countries – i.e. more than the population of the Netherlands and Germany combined – are exposed to noise levels from road transport which are potentially damaging to human health. 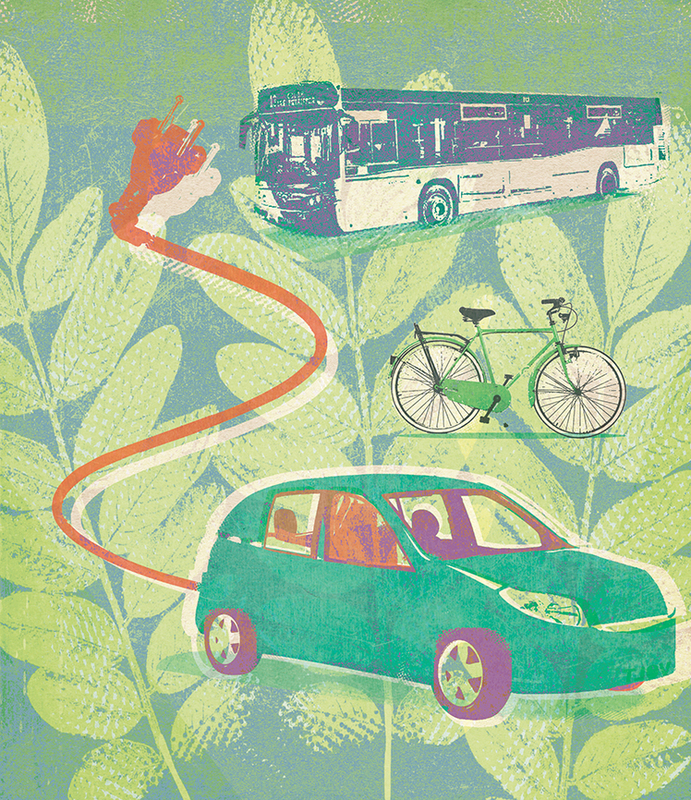 A green Europe will not be possible without a ‘green’ transport system to go with it. Nature is not excluded from transport’s effects. Air pollution can adversely affect the growth of crops and other vegetation. Pollutants from transport enter the soil and watercourses and excessive noise levels can harm wildlife. Not to mention the animals killed by transport; roughly around 6000-8000 large mammals are killed each year on the roads of the Netherlands. Nature provides ‘ecosystem services’, replenishing the oxygen in the air, sequestering carbon, providing water, and reinvigorating soils – services which need to be protected and enhanced. The transport sector also uses resources – for fuel and to build and maintain infrastructure and vehicles – and generates waste. If it is to support a green Europe in 2049, the transport system will have to have zero – or minimal – emissions of GHGs, air pollutants and noise and be an integral part of a circular economy that minimises resource use and waste. The development of transport infrastructure should result in no net loss of habitat, and its use should have a minimal impact on wildlife and the services that nature provides. Beyond environmental impacts, a sustainable transport sector should be safer. Each year, around 26 000 people – equivalent to 300 full London double-decker buses – die on the roads of the EU. Transport infrastructure also needs to be used efficiently in order to make towns and cities more liveable. Cars – particularly if they only have a single occupant – take up far more urban space than other forms of transport. A sustainable transport system would also need to be designed to guarantee that all people – no matter their gender, age, ethnic group, or physical condition – have a fair and equitable access to the economic and social opportunities that transport provides. Electrification seems the perfect answer to many of transport’s problems. If all vehicles were electrified, there would be no direct greenhouse gas or air pollutant emissions from the sector. Transport would be also be quieter, as electric vehicles emit much less noise than those using internal combustion engines. Increasing automation offers potential benefits for safety. Road transport with a high level of automation, if not completely self-driven, could eliminate human error from driving and reduce the number of accidents involving other users and wildlife. A fully automated system could also be designed to maximise the efficient use of infrastructure, thus reducing congestion. Shared mobility could bring greater efficiency, also in terms of reduced resource consumption and waste. If vehicles were designed for shared use, rather than for private consumption, they could be designed differently and made to last longer. Shared, automated systems involving smaller vehicles could complement traditional public transport, particularly in suburban and rural areas and for those with mobility problems, to improve accessibility and opportunity. Fewer privately owned vehicles would be necessary and parking spaces would also be freed up. It is possible, therefore, to imagine a transport system in 2049 in which different types of vehicle, operating as part of an electrified, automated, shared, and collective transport system, deliver all of society’s accessibility and mobility needs. The system will guide people to use the right vehicle for the right (part of a) journey. Within towns and cities, public transport, cycling, and walking will be the main way of getting around. Urban areas of all sizes will be designed to improve liveability and to facilitate access to educational, economic, and leisure opportunities. Frequent mass transit services will operate between the main urban areas, with the first and last kilometre being undertaken on foot, by bike or using shared transport services. There will still be car use, particularly in rural areas, but it will no longer be as dominant and will be frequently used in combination with other modes of transport. Outside of towns and cities, electric bicycles will offer a credible alternative to the car for many journeys. For long-distance freight, the use of rail and inland waterways will be maximised. Interchange facilities will link different modes as part of the same long-distance, freight journey. Freight distribution within cities will be undertaken by cargo bike for smaller and lighter items, with electric vans delivering the rest. While most transport will be powered by renewable electricity, for some types of vehicle and journey, particularly long-distance road freight and aviation, liquid fuels might be needed. Liquid fuels could be advanced biofuels – i.e. biofuels that are truly sustainable and at least carbon neutral – or ‘power-generated’ fuels, such as hydrogen or other fuels more similar to fossil fuels, manufactured using renewable electricity. Generating fuels similar to fossil fuels would require more carbon and this would need to be taken directly from the atmosphere for it to be carbon neutral. In order to reach carbon neutral fuels, negative emissions might also be needed. The transition to a green transport system will not happen on its own – it needs the right policies, innovation, and high levels of investment. The electrification of transport is underway, although it is early days, while automation has only just begun. The most common form of shared transport – existing buses, trains, and trams – are well used but more innovative shared services, including car, bike, and moped sharing, have only a small market share. The private, motorised vehicle still dominates: the car for passenger transport, the truck or van for freight. Rethinking urban planning by making sure that public space focuses on people and not cars is an important element of the transition. Investment can transform urban areas to ensure that infrastructure prioritises public transport, shared vehicles, bicycles, and walking. Road space needs to be reallocated away from individual motorised transport to facilitate the quick and easy use of alternatives. Transport and land use should be planned side by side, with the aim of reducing the need to travel and reducing urban sprawl. Public transport and cycling links between urban areas will also require investment. For both passenger and freight, switching between different means of transport in the same journey should be seamless to make the greenest option the most convenient one. Support for well-placed interchange facilities can help achieve this, as can integrated planning and ticketing systems. Such systems should include services such as car sharing. Rethinking urban planning by making sure that public space focuses on people and not cars is an important element of the transition. Pricing policies must reflect that green travel choices need to be affordable or they will not be taken up. Currently, if you take account of all of the costs associated with owning a car, it is often cheaper to travel by public transport than to travel the same distance by car. However, once a person owns a car, the cost of fuel on its own for a particular journey is usually less than the cost of a public transport ticket. So, for car owners, driving is often the cheapest option. Electric cars charged at home are likely to be much cheaper to run than petrol or diesel vehicles, as it is unlikely to be politically or socially feasible to tax domestic electricity in 2049 at the same level as fuel in 2019. Additionally, if many or all of the cars in 2049 are automated, it might be cheaper to send a car off to drive around all day, or to park at a distant location, than use expensive parking spaces. As a result of the potential increase in cheap, private, and self-driven mobility, there is a risk that the road system would grind to a halt, or that demands for more road building would increase. The decline in revenues from fuel duties will also hit government budgets. Perhaps the fairest and most logical solution is the introduction of road pricing to replace fuel duties, where (at least some of) the revenues raised are used to improve alternatives. In addition to planning and pricing, the market for zero-emissions vehicle technology needs to make progress. EU policies requiring lower emissions from cars and vans, and more recently from heavier road vehicles, are moving in the right direction, but not fast enough. Policies also need to ensure that electricity generation does not emit carbon, and that any liquid fuels for transport – either advanced biofuels or ‘power-generated’ fuels – need to be produced sustainably and without emissions. Industry will clearly have to be on board to make this happen and incentives to consumers can encourage the purchase and use of zero-emission vehicles. Given the extent of the transformation that transport needs to undergo, it is unlikely that the path will be straightforward. There will be winners and losers from any change, not least as some technologies disappear from their currently dominant positions. While investors seek long-term security, the pace of technological change and consumer demand is unpredictable. Policy-makers are left with managing that uncertainty and determining the response. How people use transport, from the vehicles they drive to their routes and routines, will also face change. Some people may be concerned for their personal freedom and governments must recognise this and allow individuals to experience new technologies and services in ways that enable experimentation and understanding. Trials of technologies and policies can help here. Prior to Stockholm introducing its congestion charge, only a third of the population supported the scheme. But after having experienced the benefits through a trial, a majority of Stockholm residents voted in its favour. Building a green transport system will take engagement, innovation, and investment. But the potential results – improved health, more attractive cities, lower costs, and fairer access, as well as a better environment – represent a potentially massive break for the better when compared to the transport systems we have today. This article is based on the report Green light for sustainable mobility: Vision and pathway to 2050, prepared by the authors for the Greens/EFA group of MEPs in the European Parliament.